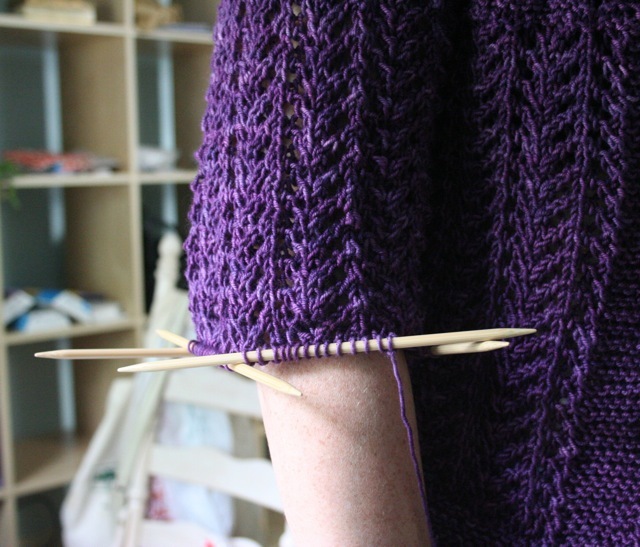 So the February Lady Sweater is on the wires, blocking, and will be dry later this afternoon. I am so in love with this yarn (and this pattern, of course). This is what I knit the February Baby Sweater in, last February. The whole time I was knitting that, I kept thinking that I would love to knit a sweater just like it, in the exact same yarn, for myself. Then Pam went and did the modifications to make the pattern fit and flatter a woman’s figure, and she offered the pattern for free! 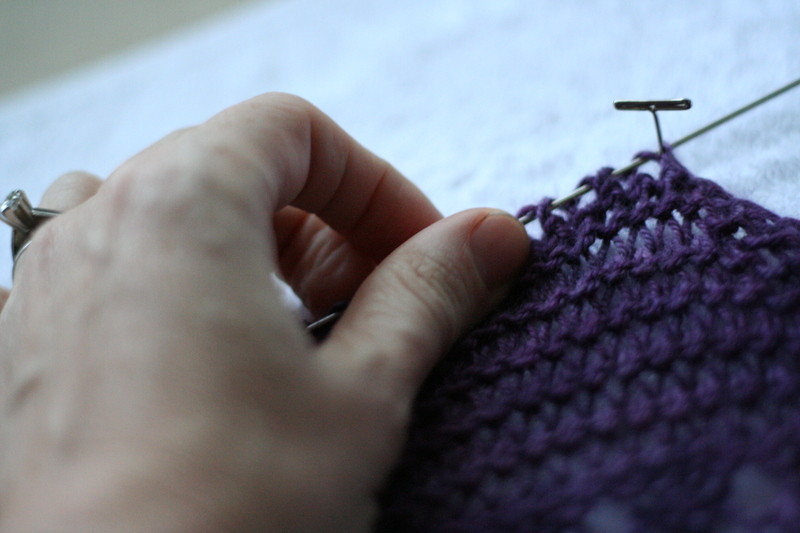 I knew in June, when she offered the pattern, that I’d be doing it in this yarn, eventually. And when fall hit, I couldn’t hold out any longer. These are purplish-bluish shell buttons, and I loved them a lot. What do you think? Shell buttons? Or should I go with a nice metal button? Or wood? Any ideas – or links – appreciated. Oh wow! 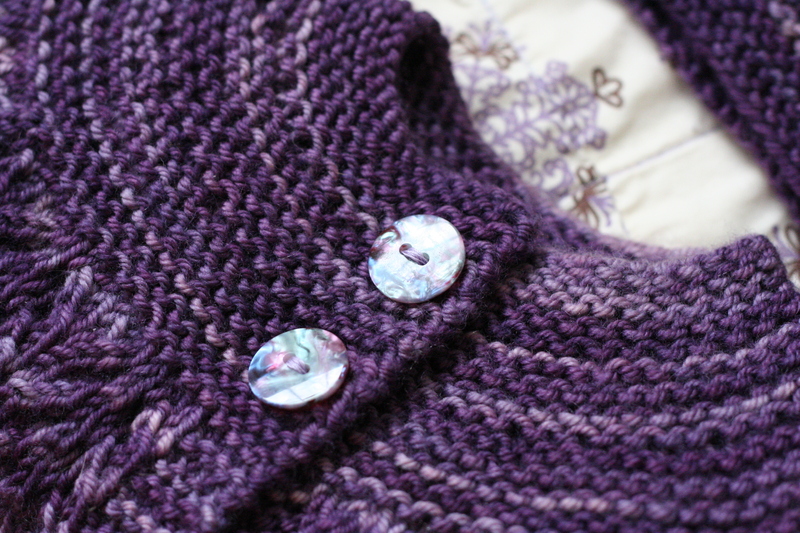 Those shell buttons are just gorgeous with the yarn! This is the second time in less than 24 hours someone has mentioned this sweater – -I’m thinking it may be calling my nae as my next biggish project. I like those buttons. Go for it. Ooh, that’s lovely. I also think the buttons you have already look great. Those shell buttons are beautiful — I think the combination of the buttons and the yarn is one of the prettiest I’ve seen. Now I really feel the need to make a FLS! This sweater feeds in to my love of everything purple! I think the shell buttons look great, but metal would go well with the purple, too. Did you use the heavyweight version of STR for this? Now I want a STR sweater! I think those are THE buttons. Shells buttons rock. The buttons are such a good call! ditto to all of the above. most definitely. Yes yes yes. Those buttons are SO GOOD. mmm, just a thought, but wood? i am going with an etsy seller. i will find the link. after i buy my button. heehee. I am partial to shell buttons, but just came across some wood ones at knitpicks that would look great on this sweater. You’ll find them easily on their site; they look like their awesome needles! Ooh, it’s gorgeous! I think the shell buttons would be perfect. The shell buttons are nice but you could go with silver if you anticipate wearing it for more dressy occasions. As for the yarn, is that sock weight or a heavier weight? Does it become drapey or saggy? Tell all, your public wants to know. Or, just tell about the STR. Gorgeous sweater. The shell buttons look nice, but I am always a fan of wooden. A women I used to work with once made a cardigan with button holes on each side. Then she made double buttons… think the kind found on the bottom of French cuffs, so that there are two buttons attached by a length of yarn. They are seperate from the sweater but can be easily attached via the double button holes. Anyway… she made the sweater white or ivory and had santa buttons, jack-o-lantern buttons, bunny buttons, etc. She was a teacher and now had a sweater to wear in the classroom all year that went with every holiday.